Can the Runner initiate an effect that makes a run while Service Outage is active, then decline to pay the additional cost? If so, does that count as the “first run” on their turn? Yes, the additional cost can be declined (and the run does not initiate). This does not count as the first run, as no run was initiated. ELP is used for the same thing all corp currents are used for: turning off runner currents. ELP is Haas, SO is NBN. This may seem like a "Duh, who cares" kind of point, but it's important when considering what currents those corps already have access to. NBN, now that this card is out, has a whopping six currents in faction. Haas has only two, and one of those two is worthless (outside of an incredibly specific type of deck). So when NBN or Haas needs a current, there's a huge disparity in their influence free selection. Haas really only has access to ELP (and one neutral current (this card is not worth mentioning), while NBN has tons of great stuff. Targeted Marketing, Media Blitz, and Manhunt are all incredibly powerful, with TarMar having the advantage of being useful in literally any kind of corp deck and being free to play on top of it. What this means then, I think, is even if usage of ELP is rare, it'll still be a lot less rare than SO will be. Haas has access to little else after all, while NBN has access to a lot (and better). What about Jinteki: Replicating Perfection? ELP isn't in every RP deck, but it's great if you have the room and inf to spare. Forcing the runner to spend not one, not two, but three clicks to get a shot at your scoring server is the equivalent of a game crime, and it gets all the more disgusting when you've got a nisei token on top of that. So would SO be favorable to ELP in this situation? Well, firstly, SO is one inf, while ELP is two. This doesn't seem like a lot, but it's big. This means two SOs can be slotted for the inf of one ELP, giving better consistency and defense against runners countering it. SO is also impossible to ignore, unlike ELP. 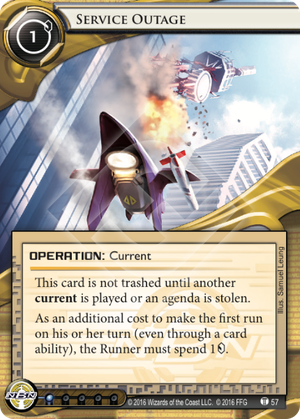 ELP doesn't do anything if the runner is using run events or certain Anarch stuff to make their runs, while SO will always tax one cred no matter what. SO also costs only one cred to use, as opposed to ELP's two cred cost (which in Jinteki decks, is important). Yet even with all that I don't see SO edging out ELP for RP decks. One cred, especially taxed several times over the course of a game, can be brutal, but it still doesn't compare to the cost of a few clicks. Let's assume both currents were to fire off an equal amount of times on average for this kind of deck, around two or three times. With SO, you've spent one cred to deprive them of two to three credits. Assuming this isn't a trash runner deck, a click is typically worth at least two creds, which means ELP costs them about four to six creds for your two. Similar ratios, but it's pretty much always true that bigger credit losses for the runner are worth the bigger investments from the corp. This gives ELP a distinct advantage of paying of significantly better significantly faster. Plus there's the added bonus in the versatility that a click provides, and what taking that away does. Sure, you're depriving them of more potential money, but you're also taking away the ability for them to threaten R&D, HQ, and your scoring server on the same turn. Or making Notoriety outright impossible. Or a bunch of other crippling possibilities, because you stole a whole click and not just one cred. tl;dr this card isn't great. In faction it's edged out by a plethora of other options, and out of faction there's a less consistent but much more powerful current to use. It may see use in horizontal taxing decks (Perhaps CTM just found a fun new tool for being even more oppressive? ), but outside of that I doubt you'll see it at all.